The teams meeting for the championship of the United States Football League’s Western Conference on July 7, 1984 both had 10-8 regular season records and had recently been hot, winning six of their previous seven games. But beyond that, there were significant differences in the composition and style of the two clubs. The Arizona Wranglers were coached by George Allen, a 66-year-old veteran of 12 NFL head coaching seasons and one in the USFL’s inaugural year. As was typical of Allen’s teams, the Wranglers relied on veteran pro talent, with strong defense that ranked at the top of the league complemented by a conservative, ball-control offense. 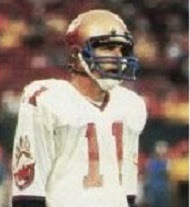 37-year-old QB Greg Landry (pictured above) directed the attack that featured two thousand-yard rushers in Tim Spencer (1212 yards) and Kevin Long (1010 yards) as well as a talented wide receiver in Trumaine Johnson. Still, Arizona got off to a slow start before coming on strong to conclude the season and, qualifying for the playoffs as a Wild Card team after finishing second in the Pacific Division, came from behind to defeat the high-powered Houston Gamblers by a 17-16 score in the Quarterfinal round. The Express, on the other hand, consisted of a large number of first- and second-year players and had an offensive-minded first-year head coach in John Hadl, a former AFL and NFL quarterback. Following a 2-3 start, the offense benefited from the arrival of rookie QB Steve Young, with talent that matched a huge contract. An effective left-handed passer with outstanding mobility, Young had second-year WR JoJo Townsell leading the receiving corps plus a group of three effective rookie running backs in Kevin Nelson, Mel Gray, and Kevin Mack to handle the ground game. The Express won the Pacific Division and then eliminated the defending-champion Michigan Panthers the previous week in a game that wasn’t settled until the third overtime period. Unfortunately, Gray, in scoring the winning touchdown, also suffered a broken leg. There had been controversy in the week leading up to the game when Hadl accused Allen of putting a bounty on Steve Young. Beyond that, there was bad feeling between the two teams, and numerous scuffles broke out during the contest. There were 33,188 fans in attendance at Sun Devil Stadium, as the Express had forfeited home field advantage due to lack of an available venue (although lack of fan support may have been the bigger consideration). USFL Commissioner Chet Simmons moved the starting time back by eight hours due to concerns about the intense daytime heat, but it was still 100 degrees at the 8:30 pm kickoff, mitigated somewhat by a light breeze. Los Angeles took the opening kickoff and methodically drove 73 yards down the field, with running backs Kevin Nelson and Kevin Mack, who had a 34-yard carry, running effectively. The series stalled at the Arizona seven yard line and Tony Zendejas kicked a 25-yard field goal for the first score of the game. Following a short series and punt by the Wranglers, Young threw a pass that was intercepted by FS Luther Bradley, thus giving Arizona good field position. The Wranglers took advantage of it, driving 36 yards in four plays culminating in a four-yard touchdown run by Tim Spencer. Frank Corral added the extra point and the tally remained 7-3 at the end of the opening period. Early in the second quarter, the Express took advantage of a pass interference penalty to retake the lead on an 11-yard run by Nelson. On their next possession, the visitors again drove 62 yards to a score, once again on a Nelson carry, this time from a yard out. Zendejas successfully added both extra points for a 17-7 lead. A promising Arizona drive came to naught when DB Darrell Pattillo picked off a Landry pass. However, up by ten points and with time running down in the first half, the Express attempted a fake punt, with Jeff Partridge trying to throw to DB Troy West, but the pass was broken up. Taking possession at the LA 35, the Wranglers were able to score a touchdown on a six-yard run by Spencer followed by a Corral PAT that narrowed the margin to three points going into halftime. The defenses dominated the third quarter as the teams traded punts. Young had difficulty completing passes, not helped by injuries to his receivers, and Los Angeles, which was already missing Mel Gray, lost Kevin Nelson, who left the game in the third quarter with a sprained neck. Still, the Express held a three-point lead and got a break when CB Wymon Henderson intercepted a Landry pass and returned it 28 yards to gain possession in Arizona territory. But, with the partisan crowd roaring, the Wranglers sacked Young on successive plays to force a punt from midfield. Arizona responded with a long scoring series. A pass to RB Allan Clark picked up 44 yards and, on the second play of the fourth quarter, Kevin Long ran for a touchdown from a yard out. Corral’s extra point gave the home team a 21-17 lead. A short LA possession that ended in a punt gave the Wranglers good starting field position at the Express 45 and they again drove to a score, this time with Landry throwing to Tim Spencer for a five-yard TD that extended the lead to 28-17. Any prospect for a comeback by the Express, now being thoroughly dominated by the Wranglers, was snuffed out a few plays later when LB Jim Fahnhorst intercepted a pass by Young. Arizona moved methodically 36 yards down the field in eight plays and FB Mack Boatner finished off the spree of three touchdowns in 11 minutes by rushing five yards for a score. With less than three minutes left on the clock, the Wranglers were up by 18 points. The Express came alive to score once, with a scrambling Young connecting with a leaping TE David Hersey in the end zone for a 20-yard touchdown. But the try for a two-point conversion failed, as did the attempted onside kick. Time ran out on LA and the Wranglers advanced by a final score of 35-23. The Wranglers overcame a significant deficit in the first half to lead in total yards (329 to 283) although Los Angeles maintained the edge in first downs (19 to 18). Each team turned the ball over twice, but the Wranglers recorded four sacks, for a loss of 36 yards, to just one by LA. Both teams were also penalized ten times apiece. Greg Landry completed 10 of 21 passes for 158 yards and a touchdown along with two interceptions, but was at his best during the fourth quarter surge. Tim Spencer (pictured at right) rushed for 94 yards on 18 carries that included two TDs and Kevin Long contributed 60 yards on 13 attempts. WR Lenny Willis topped the receivers with three catches for 60 yards. For the Express, Steve Young had his worst statistical game of the season, succeeding on only 7 of 23 throws for 126 yards and a TD, but with two picked off. Kevin Mack ran the ball 14 times for 88 yards and Kevin Nelson added 72 yards on 18 attempts that included two for scores before having to leave the game, with most of that production coming in the first half. David Hersey was the only LA receiver to catch two passes, for 27 yards and the one late TD, while WR Freddie Scott gained 39 yards on his lone reception. 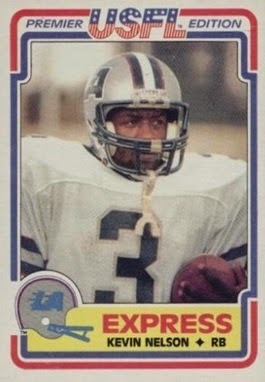 The Wranglers were beaten the next week for the USFL Championship by the Philadelphia Stars, which proved to be the end of the line for George Allen, who stepped down as head coach. 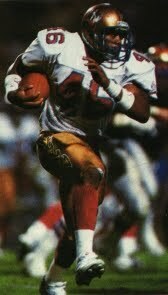 Arizona was merged with the Oklahoma Outlaws for 1985 and went 8-10 to finish fourth in the revamped Western Conference. Things got much worse for the financially strapped Express, who fell to the bottom of the conference at 3-15.